On a list of elusive observing targets, noctilucent clouds are one of the most challenging and one I have yet to spy. These clouds, also called polar mesospheric clouds or night-shining clouds, are found in the mesosphere, higher than all other clouds. Most clouds and weather on earth are confined to the troposphere, or layer of air closest to the ground. The mesosphere is located 80 kilometers above our planet’s surface. The mesosphere is a region that’s extremely cold and dry, and because of this, it is uncommon for clouds to form in an area that is not conducive to ice crystals. For noctilucent clouds to form, water vapor and dust particles for them to stick to must be present. 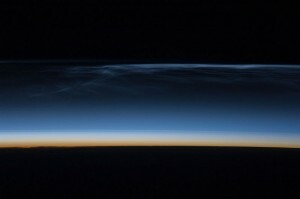 Noctilucent clouds were first reported by observers in 1885. Two years before, in 1883, Krakatoa exploded in a tremendous volcanic eruption, spewing fine ash particles all the way up into the mesosphere. Yet even though the dust from Krakatoa has long since disappeared, the clouds have not. Another source of the dust could be outer space, as micrometeoroids rain down on our atmosphere. Water vapor can enter the mesosphere due to upwelling of moisture in summertime, which is why noctilucent clouds appear more often in the summer. These night-shining clouds are more normally seen at high latitudes, including Scandinanvia and Siberia, but lower latitudes such as the northern tier of the United States have also occasionally seen them. To look for noctilucent clouds, wait until after sunset when the sky has grown dark, because these thin clouds cannot compete with bright daylight. After sunset, when the Sun is at least six degrees below the horizon, sunlight still reaches high into the upper edges of the atmosphere and causes the clouds to glow. This is similar to how satellites shine far above earth at dusk and dawn even though the Sun is below the horizon. Noctilucent clouds often are described as “electric blue”. They look similar in shape to cirrus clouds except that they are so high up they seem to be in outer space. This eerie and awesome spectacle should not be confused with the aurora borealis, which can appear at any time of night and are sheets of undulating particles that can appear in colors from blue to red to green.